For those that enjoy the travel programmes by Joanna Lumley, there is a new series starting tonight at 9pm on ITV - Joanna Lumley's Silk Road. I'm looking forward to seeing it, although fear the added frustrations to my travel temptations. I've been trying to get to Iran and/or Uzbekistan, Kazakhstan, Turkmenistan, etc... for a few years now, but so far not managed it. Saw the program (the 2nd) on Georgia - marvelous - and Azerbaijan - mixed. Even more that her previous travel programs she is going off the beaten track. Her enthusiasm for Georgia and the resilience of its benighted people was infectious. The few minutes on Georgian traditional dancing was remarkable, quite remarkable, as was the determination of these small people to maintain their culture after centuries of external dominance - unlike one other I can think of. Her attention to small/younger/innovative people and small businesses is creditable. i wish she had delivered a scimitar to the rotten Azeri government and ruling class. Her Iran Program. A bit gushy, uncritical, naïve but still enjoyable. Camera work underwhelming. Absence of traditional Persian music surprising. She could have made mention of civil rights. Huge Iranian emphasis on preserving mosques and related buildings ands, in particular on preserving their beautiful surroundings. 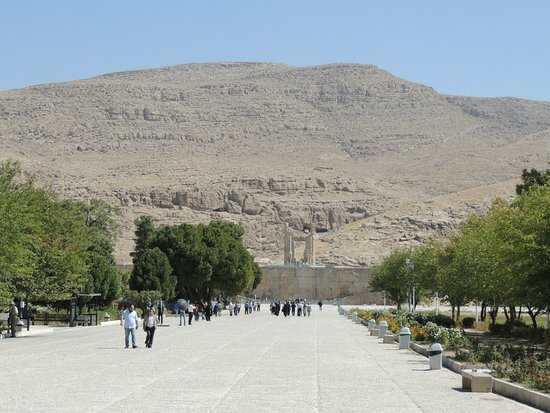 For example the ceremonial entrance to Persepolis is a huge tree forest. Great skill in preserving ancient buildings – not the Egyptian Arab Contractors concreting ‘skill’s on Empain Palace. Here is a bad shot of the park, in very dry circumstances so they tried hard, which is also used, I think, to screen the car park from view. In Giza its just uncontrolled urban development. This view is towards the artificial and huge stone platform on which the Palace was built for Darius who was the great conqueror of Egypt, Libya, coastal Sudan and much else. The new GEM Museum is surrounded by dust and an awful car/bus park. Another view from the opposite direction. Superb gardens and garden design – exactly what you expect of people living in a hot dry climate – with some people. Very early high tech long distance underground irrigation supply lines into remote cities – others have difficulty with a k or two. Cleanliness – in public places. The use of discreet 1 meter high glass ‘partitions’ to protect historical objects, they look minimal and do not obscure the view. They appeared clean. Charming, well mannered, friendly locals. Huge areas of traditional cities like Yazd that are largely and meticulously preserved – I assume the new areas are high rise. Here is a small portion of Yazd – the odd towers are for ventilation/cooling in the very hot climate. It’s a UNESCO city, badly damaged in a '97 earthquake that killed thousands, and unlike Old Cairo that was renovated at the expense of UNESCO and the Aga Khan (who has been wary for 30 years but this year provided the cash for a Cairo Mamaluk mosque that had all but fallen down under Supreme Antique ‘care’) is preserved by Iranians. The maintenance of high quality traditional crafts. A local view on Ramadan that the fasting is to remind you of the poor. Deep respect for classical learning, poetry in particular. A respect for high quality traditional food and drink. Superb communal public spaces used by locals. Locals, including relatively ordinary ones, were well dressed and presented in public areas. (oddly wrong) A conservative system in film. (There are many acclaimed exceptions to this and over nearly 30 years Iran has produced astounding art films sometimes on sensitive subjects and invariably more liberal that most would guess). She missed lots of things, many dark, but its just a TV show on a limited format. ONE BIG THING. At Persopolis, which is just the bare bones of its former glory, it seems the Iranian Supreme Tourists (Hawass banned) rent out a virtual reality headset to tourists that recreates the former full splendor of the palace. Virtual reality is a 20 year old technology and you would think that Sisi’s announced plan (18 months ago) to make Egypt the center of the IT world by the first Monday of next month and export $US10 billion in IT would lead to similar systems for Karnak, Giza and other places. Maybe the first Monday of the month following. Hardly! I'm sure one of the conditions of the team getting visas and filming rights was an undertaking to stay well away from that subject! Re virtual reality tours....a growing technique for heritage sites. Not in Egypt of course, although wasn't there some ghastly project at the old Egyptian museum...with King Tut conducting virtual reality tours? I forget the details....but recall they were laughable. If civil rights - or the lack of them - is your 'thing', Hafiz, tonight sees a return of Simon Reeve on BBC2. Now there's someone who tells it like it is, please or offend! Might be taking time but it is starting to look very nice and the new steps on the ferry are certainly an improvement and seem to me more substantial than previous attempts. If you like peace, quiet, the wilderness, with absolutely stunning views try this route.